It’s easy to put fresh fruit into cold, blended coffee drinks. Bananas and other fruits simply blend up into the drink as they would in a milkshake. It’s harder to get fruit flavors into hot drinks, however, as pureed fruit doesn’t combined well with hot coffee. Generally, you have to use pre-made, sugar-based syrups to get the effect. 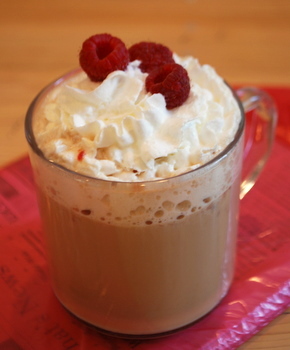 This raspberry latte uses fresh raspberries, incorporating them into the drink in the same manner that they are incorporated into some cocktails. The raspberries are muddled (mashed) with some sugar at the bottom of a coffee cup to release their juices. A shot of hot espresso – or some hot coffee – is poured in on top of the raspberries, dissolving the sugar, and topped with steamed milk. I finished mine with whipped cream and fresh raspberries. The drink was delicious, and the fruitiness was subtle, unlike the fruitiness of drinks made with thick, fruit syrups. The raspberry went pretty well with the coffee and made the drink taste very fresh and perfect for spring. In a coffee mug, muddle together (use a muddle or a fork) raspberries and sugar until fruit is pureed. More sugar can be added if you like your drinks sweet. Pour in espresso shot or about 4-oz of hot coffee, and top off with steamed milk.